Built with dependability and versatility in mind Fostoria utility lights are an essential tool with combinations suited for almost any application. Great for use in machine rooms, auto shops, construction sites, warehouses, loading docks, manufacturing plants, among many other locations. 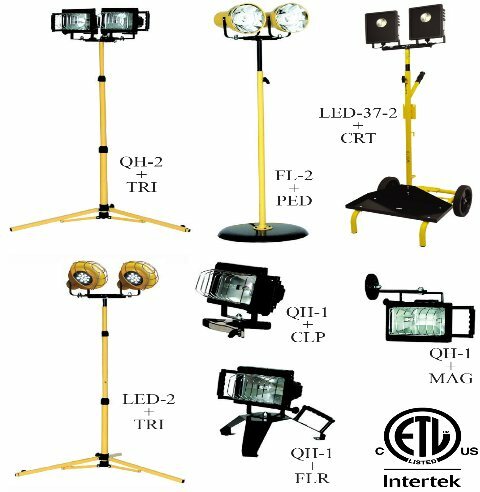 Send in an RFQ or give us a call at: 1-800-741-1258 and we will help you choose the right light for the job! Loading Dock Supply, LLC prides itself on being available to discuss your purchases. Our East Coast office hours are 8 am to 7 pm monday - friday. Our West Coast office hours are 5 am - 4 pm monday - friday. 500 Watt quartz bulbs (included). Lowest energy usage per lumens produced. Can be used with pedestal, cart, and tripod mounts only. Compliant with RoHS 2 Directive (2011/65/EU). Clamp secures light head to most surfaces up to 3"